In my printing tutorials, I strongly recommend the process of soft proofing using Adobe Lightroom. If you’re now asking yourself “what is soft proofing in Lightroom”, this tutorial will explain what you need to know. You can waste a lot of time trying to make your print match your computer display. Your printed photo won’t look like your monitor without some degree of adjustment. How much adjustment will depend on the image, the printer, the ink and the paper you’re using. Without proper soft proofing, you’ll never get the combination of these variables right. If you don’t soft proof properly you will waste a lot of money on printer paper and ink. Soft proofing helps you to produce an accurate print. This means it has a similar contrast and colour to what you see on your computer screen. The reason I recommend Lightroom for soft proofing is that it has several excellent features to help you. Before we look at soft proofing in Lightroom there are a couple of common mistakes I want to help you avoid. The first common mistake when soft proofing images is not to use a calibrated computer screen. When a computer monitor leaves the factory, the colours it displays should be accurate to a small tolerance, although this isn’t always the case. Then with use over time the colours will probably shift, along with the brightness and contrast. It’s also possible people using the computer will adjust these characteristics, especially if it’s a shared computer. In short, it’s unlikely you’re seeing an accurate display of the photo. The solution to this problem is monitor calibration. When you calibrate a monitor correctly you ensure the brightness, contrast and colours are all accurately displayed. Ideally, you would do this with a calibration unit like the Datacolor Spyder which can read and correct your screen display. The reason this is so important is that if your screen doesn’t display the photo accurately, you will never be able to match a print to it. The second common mistake is much easier to correct and it’s this. Viewing the soft proof of an image in Lightroom doesn’t change anything. For some reason, people often think that viewing a soft proof will somehow make the print correct. It doesn’t. When you view the soft proof of an image using Lightroom, Lightroom is trying to simulate how the printed image will appear. As we’ve already mentioned, this is unlikely to match the image, that is unless you make further adjustments. That’s right, after you have your image looking the way you want it to, you need to make further adjustments to make the soft proof look like the image. It’s the soft proof that needs to match how you want the printed image to look. Adobe first introduced soft proofing to Lightroom in version 4 and it’s changed very little right up to the latest Lightroom CC release (2019). When trying to find the soft proofing feature most people first check the Lightroom Print module, but you won’t find it there. Instead, head over to the Develop module where the feature’s hidden along the bottom of the display. At first, you might find this a little counter intuitive, but it actually makes a lot of sense. Remember earlier we said nothing changes just by viewing a soft proof. You need to make changes and corrections to a soft proof which you do in Lightroom’s Develop module. You can see an example of the Lightroom soft proofing feature in the screenshot below. There is a “Soft Proofing” checkbox to the bottom left of the main image preview, numbered 1 in the illustration. Click this to toggle the soft proof mode on and off. If you can’t see this, you will find a small dropdown menu to the far right of this bar. You can use this to show or hide the features that appear in the bar, including the “Soft Proofing” option. A much quicker way is to press “s” on the keyboard which will also toggle the Soft Proofing on and off. Having turned on soft proofing, you will see new options appear below the histogram, numbered 2 in the illustration above. You can see a closeup of this area in the screenshot below. At the top of this section, there’s a button to “Create Proof Copy”. This will duplicate the image you’re working on using the Virtual Copy feature in Lightroom. This produces an exact copy of the image with all the adjustments you’ve made to date. It’s a really good idea to click this because you will make all your changes to the Proof Copy, leaving the original image unchanged. The Profile drop-down allows you to select a printer profile for your paper and printer combination. 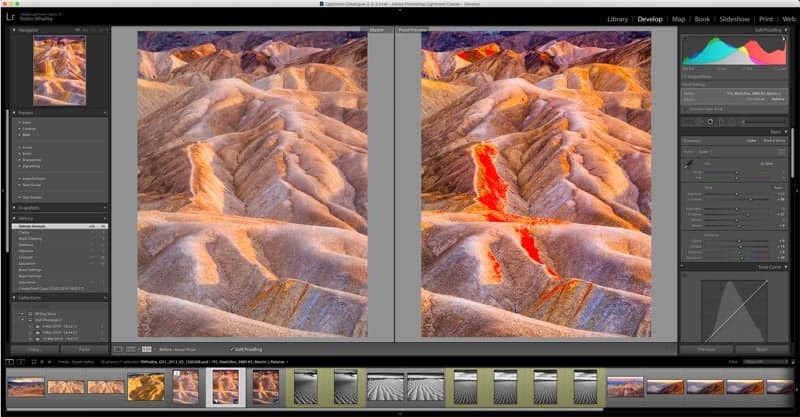 Selecting the correct profile is the key to making soft proofing work correctly in Lightroom. It’s the paper profile that’s used by Lightroom to create the soft proof. 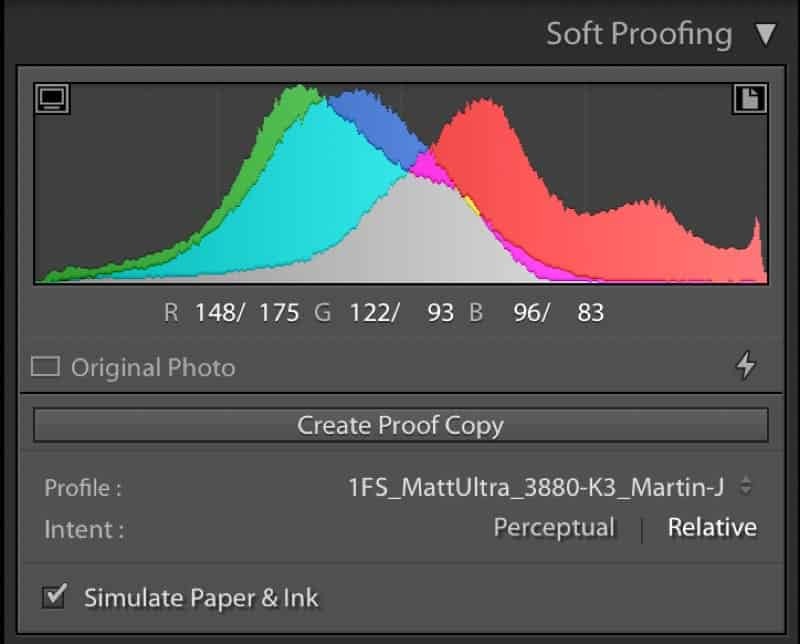 If you use one that isn’t for your paper and printer combination the soft proof won’t be accurate. It’s important you use a profile for the paper you’re going to print to, and which supports your printer. It’s quite possible you don’t have such a profile installed, in which case visit the website for the printer paper you’re using and download the correct profile for your printer. If they can’t provide one, change to a paper which you can get a profile for. Alternatively, you could have a custom printer profile made but this can be costly. Fortunately, at least a few printer paper manufacturers now provide a free profiling service for their papers. Permajet and Fotospeed are two examples. If you now look to the top left and right of the histogram you will see two icons. Ordinarily when you are in the Lightroom Develop module, clicking these will turn on the shadow and highlight clipping warnings. Now that we are in the Soft Proofing mode, they toggle the gamut warnings on and off. The icon on the left toggles the gamut warning for the monitor whilst the icon on the right is for the printer. You can see an example of the printer Gamut Warning in the screenshot below. Notice the original image is on the left and the proof copy with the warnings on the right. You might think that it’s a good idea to keep the Gamut Warnings turned on when soft proofing, but it isn’t. That’s because when they are on the prevent the “Simulate Paper & Ink” option from working. We will cover this in a moment. The Gamut Warning shows when a colour or tone is outside the possible display range. When this happens, we say the tone or colour is Out of Gamut and Lightroom needs to know how to handle it. This is what the “Intent” (or rendering intent) option does. Lightroom only supports two rendering intents which are Relative and Perceptual. When you use the Relative rendering intent, Lightroom will shift any out of gamut colours/tones to the nearest in gamut colour/tone. But this doesn’t affect any of the other in gamut colours/tones. The other rendering intent is Perceptual. When you select this, out of gamut colours/tones move into gamut but it also redistributes all the colours/tones in the image. Where an image has a lot of areas that are out of gamut this rendering intent can cause colour shifts. Don’t worry if you don’t fully understand this, just be sure to try both whilst you have Lightroom in soft proofing. If you have the soft proofing set up correctly you will be able to see which rendering intent is best. This is a very important feature to turn on when soft proofing in Lightroom. Unfortunately, its effect becomes hidden when you use one of the gamut warning options discussed earlier. Confusingly, this happens even when the option is ticked. Now a lot of people don’t like the Simulate Paper & Ink option when soft proofing because it makes the soft proof look horrible. They mistakenly think because the soft proof looks terrible their print will look terrible. The point that’s often missed is that the print will look terrible unless you correct it. Turning off the simulate paper and ink just hides it. Be sure to turn this option on and then adjust your soft proof to match the original image. Select the image you want to soft proof and open it in the Develop module. Switch into the soft proofing mode by clicking the “Soft Proofing” option to the bottom left of the main preview. Alternatively, you can press S on your keyboard. Create a Proof Copy of the image for soft proofing by clicking on the "Create Proof Copy" button. Select the Profile to match the paper and printer combination you’re going to be printing with. 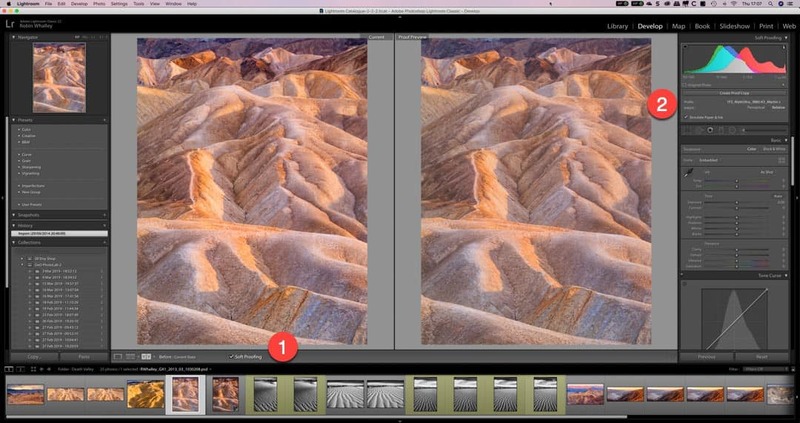 Select the option (usually to the left of the Soft Proofing option) to display the Master Photo and Soft Proof side by side. This makes it easier to adjust the Soft Proof so that it looks like the original or master image. Be sure to tick the Simulate Paper & Ink option and turn off any gamut warnings. Adjust the soft proof to match the original image or Master. Once you have your Soft Proof matching the Master image you can switch to the Print module in Lightroom. Here you can select the printing options to print the Proof Copy. Be sure you select to print the Proof Copy and not the original image. The following Lightroom Soft Proofing video which I published on YouTube should also help. You can also watch this video on my YouTube channel. I publish a new video every week, often based on subscribers’ requests and feedback. Subscribe to my YouTube channel now and be sure not to miss future videos. You probably started this tutorial by asking the question “what is soft proofing in Lightroom”. I’m hoping I’ve now answered that for you and given you a lot of information to improve your printing. If you want to learn more about how to print your photography using either Lightroom or Photoshop, please see my book “Perfect Prints Every Time” which is available from Amazon. If you’re using Affinity Photo, I’ve produced a specific Affinity Photo Printing for Photographers tutorial and video to help you.